OLYMPIA — A sweeping array of Washington legislative proposals to counter climate change have their best chance to pass into law in 2019 than at any time in recent years. But it won’t be easy for majority Democrats and Gov. Jay Inslee, a climate action advocate, to get all they want in the 105-day session that began last week. The thrust to combat climate change comes on the heels of a new Crosscut/Elway poll finding that the number of Washington voters choosing the environment as their top issue doubled — to one out of six voters. Five times that many want action on preventing the smoky wildfires that scientists say will likely increase as the planet warms, the poll showed. 2019 marks the first year in seven that Democrats hold a significant majority in both the House and Senate. Yet Democrats are not guaranteed to be united. They have not fallen uniformly in line behind Inslee on climate policy in the past, assisting in killing a series of climate-policy losses on the governor’s part. And Republicans are pointing to Washington voters’ rejection of two consecutive citizen initiatives to tax carbon emissions that contribute to global warming. All while state lawmakers have their hands full with other top-rung issues this year. Those competing priorities include finding more funds for public schools and a daunting overhaul of the state’s mental health system, which has translated into a crisis both on city streets and inside state hospitals. Inslee has targeted climate change threats for more than a decade. He and leading Democrats are clamoring for action on multiple fronts in the fight against a warming planet and related crises such as wildfires in forests, increased ocean acidity and rising seas. “This is a tipping point moment” for action on global warming, Inslee told Capitol reporters recently, noting that ash and smoke from wildfires have reached Washington urban areas in ways that make the growing threats of climate change real even in a relatively green state like Washington. House GOP members have favored market incentives rather than energy mandates in the past, and Republican Caucus Leader J.T. Wilcox of Roy foresees a similar approach this time. One member, GOP Rep. Richard DeBolt of Chehalis, is working on a major proposal to reduce emissions using incentives for utilities and manufacturing and also promote the capture of carbon through forestation. But most Democrats want aggressive action and mandates — especially at a time the Trump administration is backing away from an international climate agreement and undoing federal regulations on power plants. The 2045 target for a clean energy grid is a step already taken by California and Hawaii to shift from carbon-emitting fuels to renewables. Under the plan, coal power would cease by 2025 and the grid would become “carbon neutral” by letting utilities use clean energy investments as credits to offset emissions from any remaining carbon-emitting power generation. These offsets could be as simple as investments in electric vehicle charging stations, home conservation investments or buying other clean energy credits from the renewable energy market. These steps would help utilities raise their share of renewables to 80 percent, according to Inslee energy adviser Lauren McCloy. Currently the state’s grid is about 75 percent non-carbon emitting but some private utilities are far below that, McCloy said. The relative clean mix is mostly because of the system of federal hydroelectric dams that supply two-thirds of the region’s electricity; most of the remaining carbon-free electricity is from renewables such as wind and solar or nuclear power. Washington is already expected to see its last coal-fired electrical plant shut down by 2025 in Centralia. And major private utilities such as Puget Sound Energy may end their reliance on power from Montana-based coal plants as soon as 2028. By 2045 all of the electricity grid would get power from renewables such as wind, solar, biomass, renewable bio-gases or nuclear power. The potential cost to utility consumers is just one issue that needs to be worked out. But Democrats are ready to move, says Rep. Beth Doglio, an Olympia Democrat and longtime advocate for climate action. “It’s time,” Doglio said. The transportation sector is the largest emitter of greenhouse gases in Washington, and less carbon content in biofuels could help reduce the emissions. But as with other of Inslee’s past failed initiatives on climate, this one succumbed to opposition from Republicans friendly to the oil industry. They barred the Senate door to this kind of legislation when they had a slim coalition majority from 2013 to 2017. This time around, Inslee and allies have regrouped and they hope to enact such a fuel-blend mandate by legislative action. Advocates say the fuel blend law will boost bio-fuel job creation at existing facilities and, according to Fitzgibbon, could even spur oil refiners to get in on bio-fuels production lest they miss out on potential profits. The fuel standard would echo policies already used by California, Oregon and British Columbia. The state Building Code Council revises construction codes for commercial and residential buildings every three years, and the 2018 review is still underway this year. But climate hawks including Rep. Doglio want to tighten the energy code portion for commercial buildings over the next decade. They would also give individual cities and local governments authority to speed up the pace for adopting energy efficient home goals now scheduled to be met by 2030. Some AGC members are leaders in the green building field, and the group needs to learn more about incentives for building retrofits and other elements of the package that is still being drawn up, according to VanderWood. But the proposal faces immediate opposition from homebuilders. Currently only Seattle has its own separate energy code, having gone first in this arena years ago, says Jan Himebaugh, government affairs director for the Olympia-based Building Industry Association of Washington. Himebaugh argues that the value of past upgrades in the code need better assessments to determine how well the housing sector is on pace to meet 2030 code targets that were first set in 2006. She also cautions that changes to energy codes have complicated impacts on building codes. Himebaugh also fears impacts on housing costs at a time home affordability is at a crisis level. A patchwork of city or county codes could be confusing as well as complicated for builders with multiple projects in different jurisdictions, she argues. Himebaugh said builders in Thurston County, for instance, could conceivably see different code standards and requirements for homes built in neighboring cities of Olympia, Lacey and Tumwater. But climate activists note energy-related emissions from buildings are the second largest source of greenhouse gases in the state. Reducing energy consumption in offices and homes may require higher upfront costs but would reduce operations costs over time. Not all of the $1.1 billion Inslee has proposed for orca recovery work is strictly devoted to saving the state’s dwindling population of salmon-eating killer whales, currently at its lowest point in decades at 75 whales. About $363 million would be used to improve salmon habitat and another $296 million for improved fish-passage upgrades that open habitat on salmon bearing streams, many of them along state highways. And improved fish runs is one piece of a complicated strategy to aid the so-called “southern resident” killer whales. In order to boost the amount of money available for culvert work and to ensure funding over the long haul, Inslee is proposing a three-tier for the state real estate excise tax on sales tied to development. The governor’s proposal would tax people selling property worth more than $1 million more than those selling property worth less than $250,000. But the organization, which has supported transportation infrastructure investments in the past, has not formally come out against it, according to Nathan Gorton, government relations director for the Realtors association. 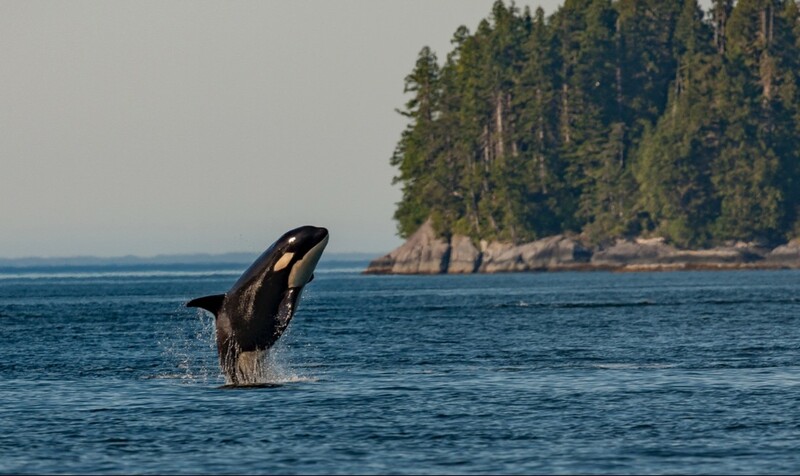 Inslee is also calling for laws doubling the distance vessels must stay away from killer whales, to 400 yards, and a go-slow zone for all vessels within a half-mile of the “southern resident” orcas, the ones that visit Puget Sound. He also called for a three-year ban on whale watching targeting the southern residents. When vessels are too close to the animals, it interferes with their ability to locate prey — primarily salmon — using echolocation. Other orca and fish-related proposals deal with water quality rule changes to allow more water spill over Columbia River dams. More water to speed the flow of the river and boost survival of salmon smolts headed to sea could also boost survival for the endangered orcas that feed on coastal fish stocks. The most ardent salmon and orca advocates want to see removal of four dams on the Snake River, a major Columbia tributary, which would benefit salmon — and by extension, orcas — by helping little fish get out to see more safely and spawning adults return more successfully. However, Republicans from Eastern Washington have been dead set against dam removal, which was not recommended by either the governor’s task force or Inslee, and it seems unlikely the Legislature would go that far this year. Rep. Doglio and her Senate counterparts are developing a bill to curb use of toxic chemicals that end up in waterways or contaminate habitat used by the Puget Sound orcas. Toxics cleanups worth millions of dollars also are proposed. Other legislators are proposing bills to cut down on plastic trash by banning single-use plastic bags still used in many areas of the state by grocers and retailers. Seattle, Tacoma and San Juan and Thurston counties have already banned that use. But one critic with the conservative Washington Policy Center argues that use of cotton cloth reusable bags in lieu of plastics is more energy intensive overall. This story has been corrected to show the phase-out of coal power under SB5116 would be required by 2025.